Breitbart Furious After CNN Recalls When Roy Moore's Christian Hate Group Called Obama A Secret Muslim - Joe.My.God. Alabama US senate candidate Roy Moore’s foundation shared a video on its Facebook page in 2015 that uses out-of-context video clips of then-President Barack Obama to promote the conspiracy theory that Obama is a Muslim. The Foundation for Moral Law, the non-profit Christian legal organization that Moore founded in the early 2000s, shared the video titled “OBAMA THE MUSLIM, HIS OWN WORDS” on November 18, 2015. Moore currently holds the title of president emeritus at the foundation. 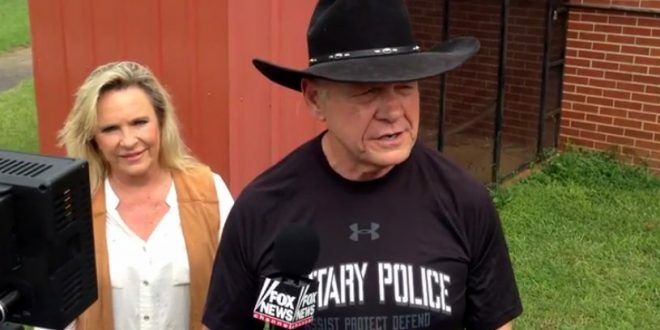 Reached by phone, Moore told CNN’s KFile that he had not worked at the Foundation for years, but said that the video did not reflect his personal views. Asked if it reflected his wife’s views, he said, “Sir, I can’t speak for other people. My campaign has nothing to do with Obama. He’s not President. This is kind of ridiculous.” Asked if his wife wanted to comment directly, he said that she was not with him at the moment and directed the reporter to contact his campaign chairman. Outside of the fact that political spouses have always been off-limits, and above and beyond CNN’s glaring hypocrisy and leftwing bias, this is par for the course for CNN, especially CNN’s Andrew Kaczysnki, who shares the story’s byline with Chris Massie. Just like the loyalty tests of old, unless you believe what the media demands you believe, the corporate power of a CNN will be mustered as a means to personally destroy you and your political career. In other words, unless you convince the media you truly believe that Obama is a good Christian and American, you cannot serve in public life. Remember all those times Breitbart didn’t attack Hillary Clinton’s “always off-limits” spouse?